The past few months in Brexitland have been dominated by news about talks, and deals, and negotiations and how the process of leaving the EU is going to go, but there hasn’t been much talk of what’s going to happen after. There are a lot of things that young people really care about that feel in danger of getting overshadowed. So we thought we’d put our noble caps on, and try and answer some burning questions. Campaign group Undivided has asked a lot of young people what they want out of the Brexit negotiations. Turns out that regardless of whether they voted to stay or leave the EU, they care about what’s going to happen to the environment. According to Undivided's research, 93% don't want the government to abandon the UK’s climate change commitments. A 2016 UK-wide poll found that nine in 10 young people want politicians to do more to protect the environment, almost two thirds said it was their "top priority" when they voted. Michael Gove (he’s the UK’s environment minister) has argued that leaving the EU will make the UK greener. He made a speech where he painted a picture of the UK as being at the front of the fight against climate change. He claimed the EU actually holds the UK back, and that he would establish a new independent body to “champion and uphold environmental standards” and “hold power to account”. Want to re-publish this piece? But people are sceptical. We spoke to Dr Viviane Gravey, who lectures in European Politics at Belfast University, and Shane Tomlinson, the director of a think tank called E3G, to find out if Gove’s environmental plan is realistic, and what Brexit will really mean for the planet. The UK does have its own climate laws outside of the EU. The Climate Change Act, which was introduced in 2008, had strong support from people from lots of different political backgrounds, and the UK showed that it could be a leader in climate policy. There’s also a lot of public appetite for action on climate change, not just among young people. A government survey found that 71 per cent of people were worried about climate change. But, says Tomlinson, “the challenge is how this public will can be translated into action”. The first problem, Dr Gravey argues, is that even if climate change is something everyone agrees on, it is absolutely not the top of anyone’s agenda at the moment, because of, you know, Brexit. And, argues Tomlinson, just how much the environment is *not* on everyone’s agenda is actually really dependent on how ‘strong’ the economy is, and what the government's priorities are. , which could lead to cutting back regulations, and de-prioritising the environment. “Climate and environment commitments could all too believably be sacrificed on the altar of short-term gain,” he argues. And while Michael Gove might argue that the UK can now be more ambitious than ever on its Brexit policy, it was always free to do that under EU law. The new ‘freedom’ that Brexit gives the UK is the ability to “go lower” than the EU base levels – that could mean cutting environmental regulations to help businesses out if things get really tough. "Did somebody say 'secondary legislation'?!" 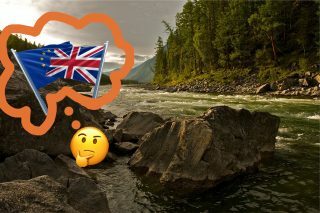 One of the main threats to the UK’s environmental policy is that Brexit will change the way lots of laws are made and enforced, because quite a few of the rules around environmental policies will become what’s called ‘secondary legislation’, Gravey explains. Secondary legislation is when the government delegates the power to make and administer a law to a sub-group of people. They normally do it when something is really technical, so they'd rather get 'experts' to administer it and then amend it without needing to get the rest of Parliament involved. Under EU law, Gravey says, all member states have to agree before something gets changed, which makes EU environmental laws more secure. When the UK leaves the EU, Gravey says, “it will just be weaker law and easier to cut”. The whole 'holding the government to account thing' is shown pretty clearly in an ongoing case about air pollution in the UK. A group of UK lawyers have used EU law to take the government to court over its failure to tackle pollution levels in the UK on three separate occasions. Even if Michael Gove's plan to replace that 'holding to account'-ness with a new body goes ahead, it's unlikely that the laws underpinning it would ever be strong enough for that to happen. There’s a big question mark over who will hold the government and businesses to account after Brexit, Gravey says. Currently under EU law, UK citizens can take the government and businesses to court for failure to comply with environmental laws – that’s currently happening over air pollution levels – it’s unlikely that they’d be able to do that under UK law. Basically, Gravey argues, having the EU as a kind of overarching body on things like the environment “empowers the citizen” to challenge the government. "The environment doesn’t listen to borders"
The extent to which an EU-less Britain can be a leader in climate change on some level depends on its other international priorities. At the moment, it’s trying to negotiate a post-Brexit trading deal with the US. “Given Trump’s scepticism on climate change, and the low environmental standards the US has on many agriculture and chemical products, this could compromise the UK’s ability to form other alliances on green issues,” Tomlinson said. The EU gave the UK natural international allies. If it loses support of the EU member states it’ll find it a lot more difficult to throw its weight around on environmental issues internationally. Both Tomlinson and Gravey are pretty sceptical about how environmental protections can survive in a post-Brexit UK. But as with anything to do with Brexit, it’s impossible to know what’s actually going to happen. “I might be pleasantly surprised,” Gravey says, “I hope I am.” She doesn’t sound convinced.